Let me first say I am hard of hearing and wear a hearing aid. I have been diagnosed in 1996 and started wearing a hearing aid in 2007. The technician told me that even with two hearing aids - as both ears suffer from calcification - there would still be words I will not able to hear properly. If you look at any brochure from companies that make hearing aid, they all focus on people enjoying life, activities, spending time with family and friends, as well as all the other things they were deprived of before wearing a hearing aid. Since one tends to become anti-social if not able to hear people, and worse, in the Lebanese society you are labelled all kinds of insulting epithets because of it (trust me, I know first hand!). 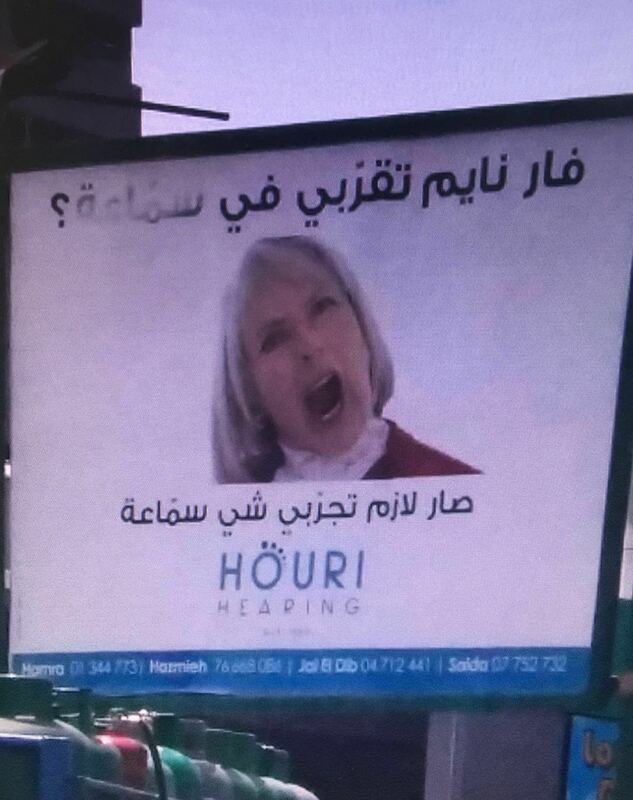 Which is why it is quite upsetting to see this ad from Houry hearing center. The line says "it is time for you to try a hearing aid" and the hard of hearing person hears it as "this crime is new to fry a...." - which is exactly the stereotypical look the Lebanese society has on the hard of hearing. A bunch of people who are corny enough not to hear words properly and who invent sentences because it suits them. Sad, as a lecturer, consultant, blogger, writer, publisher and a million other things, the last thing I want is for people to look at me this way.